How will Volkswagen Group reach its target of becoming No. 1 in global sales? What are the obstacles, challenges and risks facing its bold plan? In the latest issue of Automotive News Europe, we talk with VW leaders as the automaker pursues its goal. The 60-page quarterly magazine, which will be distributed free at the Geneva auto show and will be available as a digital edition on Feb. 22, begins our coverage of the show. The Automotive News Europe Executive Edition contains interviews with leading executives across Europe, provides a glimpse of what's ahead for Europeans in Russia and China, and gives sales data. Automotive News Europe will be published three more times in 2011 -- in June, September and November -- and will be distributed at the Automotive News Europe Congress on June 29-30 in Cologne, Germany, and at the Frankfurt auto show in September. 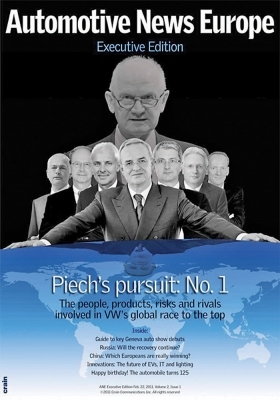 To see the latest digital edition, go to autonewseurope.com. To subscribe to the digital or print edition, go to autonews.com/ europesubscribe.